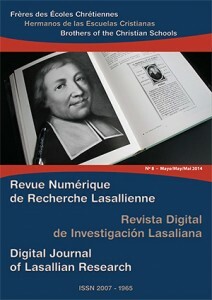 The eighth issue of the Digital Journal of Lasallian Research is now available on the Institute’s website. The Lasallian Way: One Thought, Multiple Views, a follow up to the seventh issue, offers a multi-cultural perspective of Lasallian research today. Both issues highlight innovative topics emerging in Lasallian research, new perspectives in Lasallian thinking, and how traditional Lasallian research can be revisited and reconstructed. Two authors in this issue are from the Lasallian Region of North America (RELAN): Brother Paul Aubin, FSC (District of Francophone Canada) and Brother Philip Rofrano, FSC (District of Eastern North America). This recent issue ends with a brief look at the expectations of the Service of Research and Lasallian Resources in the future. The Digital Journal is published twice a year with the goal of surfacing new Lasallian research.